Ben Hecht's activism began when he met Peter Bergson. Hecht wrote in his book Perfidy that he used to be a scriptwriter until his meeting with Bergson, when he accidentally bumped into history - i.e. the burning need to do anything possible to save the doomed Jews of Europe (paraphrase from Perfidy). After meeting Bergson, Hecht dedicated himself to working with his rescue group, and after the war ended he continued work for the establishment of the State of Israel. He wrote the screenplay for the Bergson Group’s production of A Flag is Born, which opened on September 5, 1946 at the Alvin Playhouse in New York City. The play starred Marlon Brando and Paul Muni during its various productions. 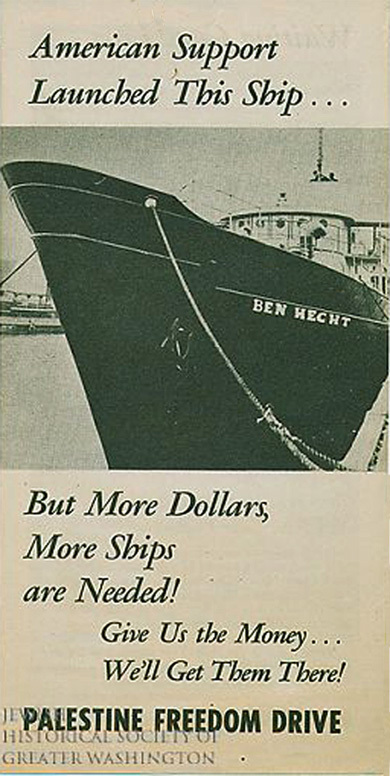 The proceeds from the play were used to purchase a ship that was renamed the S.S. Ben Hecht, which carried 900 refugees to Palestine in March, 1947. The British Navy captured the ship after it docked and sent 600 of its passengers to detention camps in Cyprus. The S.S. Ben Hecht later became the flagship of the Israeli Navy.